Daryl Johnson (Worcester Park, United Kingdom) on 14 August 2013 in Food & Cuisine. 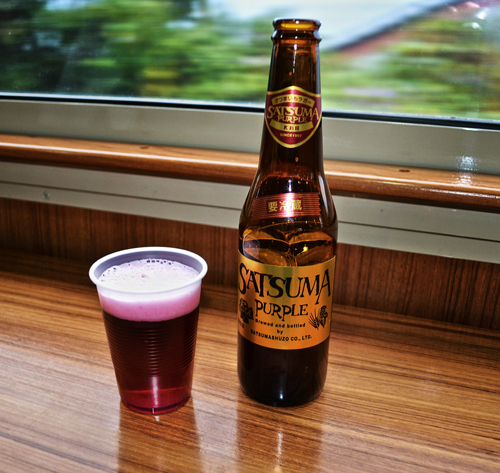 They were selling bottles of satsumaimo (sweet potato) flavoured happoshu (a Japanese beer-like drink) on board. Satsumaimo are a famous local product. 'Satsuma' is the traditional name for the area; this is also where the fruit of the same name comes from. Beautifully-rich colors that you've captured here!! What a hoot I got out of your narrative! I was finding it so informative and then to end it with how bad it taste gave me a good chuckle! @gerard1948: Hah! Good idea gerard!